On December 1st, 2016 I tipped the scales at 234 pounds, the most I’d ever weighed in my life, a good 50 pounds overweight. I felt every pound of it. My feet hurt, my knees hurt, my back hurt. I couldn’t keep my pants up because my gut was bigger than my hips and I had constant heartburn. I was getting through the day with Aleve and Tums. Something had to change. My nephew Tom was ready to take over the farm, and I was happy to turn the day to day work and worry over to him. I had been working part-time for Complete Wellness Solutions doing computer programming, and on December 1st I started full-time with them. 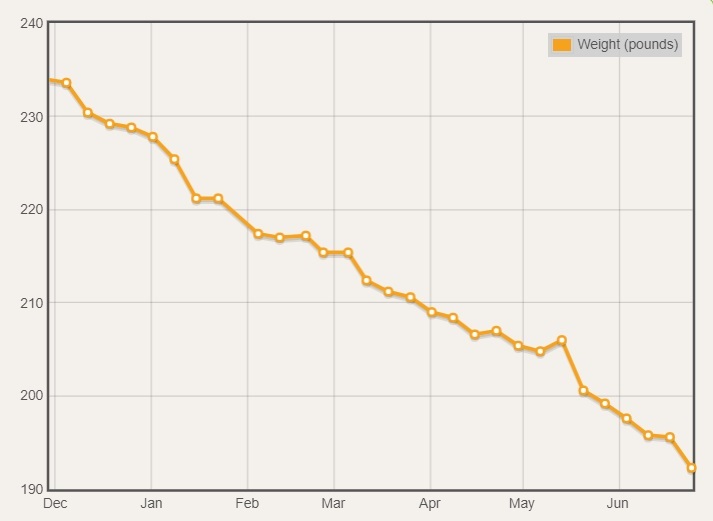 With the change – back to a regular Monday through Friday job, I started exercising daily and eating lighter. Running was excruciating, I’d run 100 feet, and walk 300. Foot pain, shin pain, knee pain, hip pain… I ran a marathon 20 years ago at a faster pace than I could maintain for 100 feet now. I was embarrassed to be me. The weight started to come off, fast. The running improved, but not as fast. I was still lumbering along, trying (and failing) to run more than a half mile at a time. But I was improving, and in a paroxysm of optimism I signed up to run the Turtle Days 5K. If you’re not from around here, Turtle Days is our annual summer fair commemorating a farmer who thought he saw a turtle “as big as the roof of a car” in a local lake back in the 1940’s. My Dad was a teenager then and remembered driving out to the lake to watch the attempts to find the turtle (spoiler alert: they don’t find it). I hadn’t run a race since 2006. When I started farming after we lost my brother Dave running fell by the wayside. I still liked to run, but there was no time for it in the planting and harvest seasons. It got harder and harder each year as I got older to pick it up after the 2 month layoff for planting or harvesting. And so on June 17th I toed the line in front of Churubusco High School for my first race in over 10 years. The course went around through town and finished with a lap around the track at the high school. I last ran around that track in 1974. Back then I could run 800 meters  in 2 minutes and change. It was strange to trundle around it, 40 plus years gone by at a 5 minute per 800 meter pace. But I finished, still standing in 30:02, exactly 10 minutes over my personal best for a 5K. And I couldn’t be more proud of that time. I promised myself a prize after I reached my first set of goals, which were to run a 5K and to get under 200 pounds  . 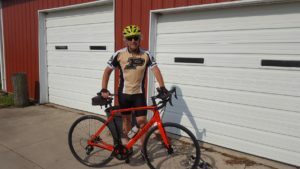 When I finished the Turtle Days 5K I’d reached both of those, so after the race I went into Summit City Bicycles and picked out my prize, a Specialized Roubaix. I love to bike, and I’d been riding a 20 year old Cannondale I’d bought over 10 years ago secondhand from a buddy of mine. A Roubaix is way more bike than I need, but I love to get out and ride, and I love the precision and quality of the bike. 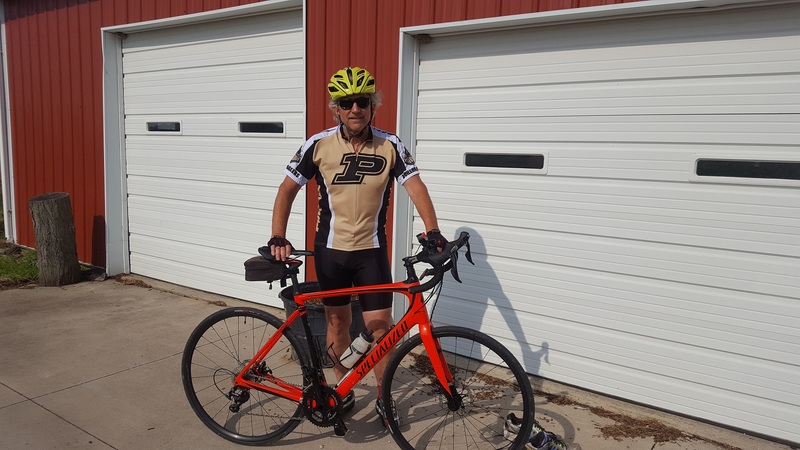 I’ll turn 60 years old in just a few days now, and I figure on July 22nd I’ll be cranking out some miles on the Roubaix, still standing. 1.Back then we ran yards, not meters. But despite whatever you may have heard, a yard and a meter are the same thing. 2. 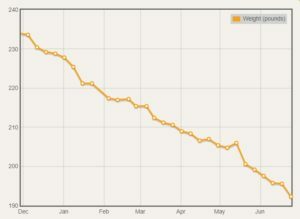 I’m at 192, down 42 pounds as of July 4th. This chart is from the application I program at Complete Wellness Solutions. It hasn’t hurt my progress to be working at a company whose business is wellness. Good work. Keep it going. But don’t embarrass me on the hills tomorrow.